Step 1 Butter a 9- by 13-inch casserole. Using a serrated knife, cut the croissants into 3/4- to 1-inch cubes (you will need 6 cups) and scatter half of them in the casserole. Set the remaining cubes aside for now. Step 2 Melt the butter in a large sauté pan. Add the onion and sauté it over medium-low heat for 5 minutes, stirring often. Stir in the spinach (you may have to do this in batches) and cover the pan. Let the spinach cook until tender, 4 to 5 minutes, stirring occasionally. Step 3 Spoon the spinach over the croissant cubes in the casserole. Then sprinkle on half of the cheese and all of the ham. Next, add the remaining croissant pieces and the rest of the cheese. Step 4 In a mixing bowl, whisk the eggs, half-and-half, mustard, salt, pepper, and basil just until blended. Ladle the liquid evenly over the layers in the casserole. Press the croissants down gently with a fork to dampen all of it. Cover the casserole with plastic wrap and refrigerate it for at least 2 hours or overnight. Step 5 Heat the oven to 350°. Remove the plastic wrap and bake the strata in the center of the oven until it is puffed and golden brown, about 45 to 55 minutes. Transfer the casserole to a wire rack and allow it to cool for at least 10 minutes before serving. Step 1 Alternately spoon the grapefruit sections and the sliced strawberries into 6 goblet glasses until you have enough fruit in each to make a nice serving. 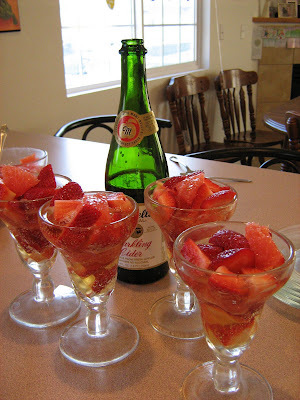 Step 2 Slowly pour enough sparkling cider over the fruit to almost cover it. Add a sprig of mint to each goblet, and your treat is ready to eat. Divide dough into individual roll-sized portions. Press each portion into a flat circle. Place 1 large marshmallow in the center of each roll. Pinch roll dough very firmly around the marshmallow. Roll each into a seamless, or nearly seamless, ball with your hands. Brush rolls with melted butter. Sprinkle sugar mixture over rolls. Cover with plastic wrap and put in refrigerator overnight. On Easter morning, preheat oven to 350 degrees. Take rolls out of the fridge and bake for 15 minutes or until rolls are golden brown. These rolls will be hollow in the middle- a fun take on the empty tomb. This was a really great Easter breakfast because I put the strata and the breakfast rolls together the night before and just refrigerated them overnight, so all I had to do was pop them in the oven on Easter morning and assemble the fruit. This was a great way to make Easter morning special for us. I think it is going to be a new tradition! Looks Yummy! The only one I did was the breakfast rolls. They will definitely be a yearly tradition though! Mare! I'm making the strata for Chris' work breakfast tomorrow. I'm sure it will be delicious! Thanks for the great idea.